Looking to transfer, sale or purchase shares in an Australian private company? Download our form, suitable for all situations, with complete guidance notes. This document creates a transfer, sale or purchase of shares in a private Australian company. To effect the legal transfer of shares in an Australian company listed on the stock market, you will need a stock broker. 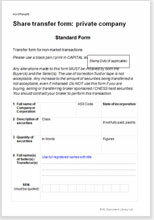 This share transfer form is suitable for anyone wishing to record the details of a share transfer with the company secretary of other registrar of the shares of a company. When you buy this document, we deliver two versions, with detailed but simple explanatory notes. This version is in the time honoured form which will be recognised and accepted by even the most venerable and bureaucratic registrars of companies. This form also contains all the information necessary for a valid transfer. However it is in simple form and plain English. You need ONLY one of them! The notes make clear exactly when we recommend each to you. Helpful guidance notes at every stage. "Net Lawman is a simple cost effect way of preparing many of the legal documents my business requires."